They refinished my hardwood floors and replaced all of my baseboards. I couldn't be happier with the job that was done. They were very conscientious about consulting me with my options and making sure that I got what I wanted. They also did a few little extra repairs that were needed to make the finished project look great. Everything went according to schedule. I can honestly say I would highly recommend them - I love my new floors and baseboards! I had wide plank French Oak installed in a October and from the get go, I was impressed with Mark coming to open the show room on his day off in order for me to pick out the material. Mark was very understanding of my financial constraints, time I needed it to be completed and was very helpful with picking out the product. The installers were great and were accommodating even during a move into the home. I love the finished look, and I would highly recommend him for any flooring job in the future. 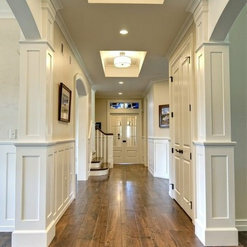 Phoenix Hardwood Floors goes the extra mile to ensure client satisfaction. They have quality workmanship, and a high degree of skill. However, they need to improve on their time management, punctuality, and reviewing the work order with the prospective client prior to beginning work. Overall they did a really great job. Phoenix Hardwood was able to fix the couple of issues we had throughout the process. Initially trying to schedule them was a little difficult, but it was around the holidays. They are vey nice and offer reasonable prices. Mark was professional and courteous from start to finish. I had 40 year old red oak hardwood floors that were in terrible shape; dark, dirty and scratched up. He took the time to explain all of my options and the various costs for each so that I could make an educated decision. He and his partner really are artisans and they take pride in making your floor look beautiful - and they DID! I am beyond thrilled and admire my floor every day. The house is completely transformed. 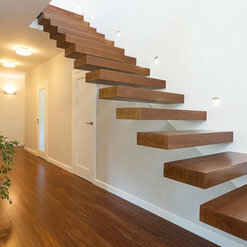 I had originally hired a contractor to do my stairs. I wanted the carpet removed and wood put in place that matched my basement stairs. They did an awful job, so I started looking and found Phoenix Hardwood Floors. Mark came in and he was just fabulous. I love the company and can't say enough good things about them. They are very professional and skilled. The two workers were respectful of our hours and did phenomenal work. I have already referred them to four of my friends. Mark and Dan did an awesome job finishing our project on time and we had no issues. We were moving and I had a pretty tight schedule. They did about 2,400 square feet and did a tile demo for us. 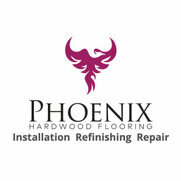 Phoenix Hardwood was very meticulous in their work and very responsive to the requests that we had. We have over 6000 square feet and they did most of the floors in solid wood. It is a two story, older house that was built in 1986. They had their work cut out for them since the house had lots of stairs. Dan did the stairs himself and was picky about how they were done. He was OCD about it and made sure there were no creaks and did a phenomenal job. We even felt comfortable enough to give Dan a key to our house so he could come and work even when we weren't home. I highly recommend hiring this company, their work is exceptional! Commented: Is this floor hickory? Do you sell it?This isn't hickory, this is barnwood, most of it is oak, but varies depending on where it comes from and so forth. We can have it milled up for you. We'd be happy to help you.